Water and Liberty... these are the words that best describe the splendour that pervaded San Pellegrino Terme, in Bergamo, at the beginning of the 20th century, when in a short period of time it went from being a small country town to becoming an international tourist centre. Thanks to a huge injection of foreign capital, the architect Romolo Squadrelli and the engineer Luigi Mazzocchi created two of the best Liberty Style buildings in the north of Italy: the Casino, or Grand Kursaal, and the Grand Hotel. The Casino is a two-storey building with an exedra on either side extending out as if to embrace the visitor. The structure also features two towers rising upwards, providing the complex with scenic strength and drive. The façade exemplifies some of the features of the Liberty Style, such as the trend of using new materials like concrete, wrought iron and glass, as well as the constant presence of motifs from nature. Highlights of its profuse decoration on the façade include the artistic cement work by Giulio Groce in his Triumph of Bacchus, medallions with the busts of famous composers and many decorative elements based on nature subjects, amongst which can be found two wrought iron lampholders with floral themes by Mazzucotelli. The theme of the vestibule is the Earth, featuring floral elements. On the right side, one cannot help but appreciate the extremely beautiful window by Beltrami entitled River God with Ivy and Vines. 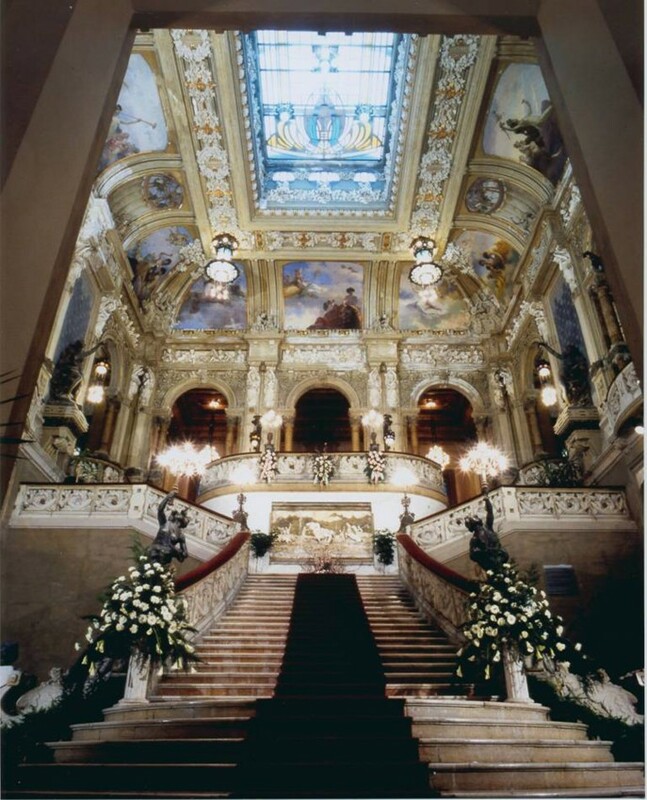 But the heart of the Grand Kursaal is undoubtedly its majestic main staircase, flanked by two lampholders in the form of two young figures, one male and the other female, by the Milanese sculptor Tagni. The subject of water dominates the lower part of the staircase, with admirable golden panels representing the Horses of Neptune. 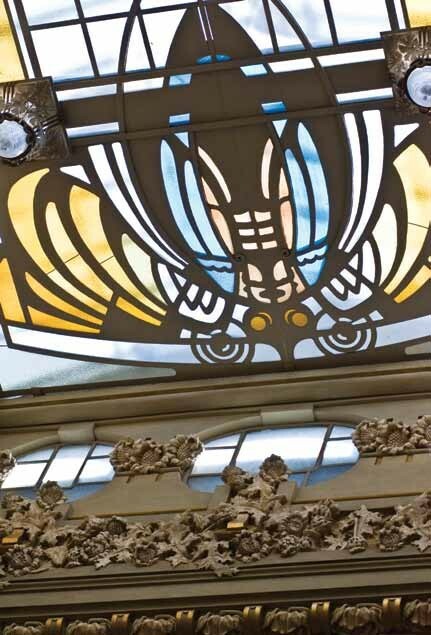 The sky is portrayed on the ceiling, with a skylight made up of coloured glass representing two butterflies, a sign of changing times. Natural light illuminates the entire staircase and ceiling paintings, by the painter Malerba, representing the twelve zodiac constellations and their corresponding months. 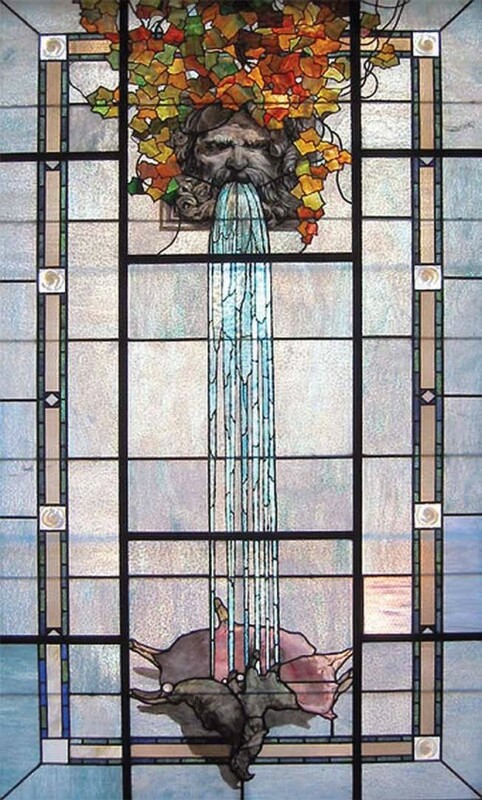 There are many profusely decorated rooms on the first floor, highlighted by the Reception Hall, with a striking centrepiece stained glass window entitled Spring. On the other side of the Brembo River can be found the Grand Hotel, a major work that inaugurated the Liberty Style in San Pellegrino. The façade, featuring an imitation brick red colour, is rich in floral decoration and other symbolic elements, such as insects, animals and mythological figures. The central part of the complex has some outstanding caryatid figures that seem to support the imposing portico at the base of the cupola. While on the inside, the design of the lamps, mouldings and real or painted tapestries present the linear stylisation that characterised the Liberty Style. 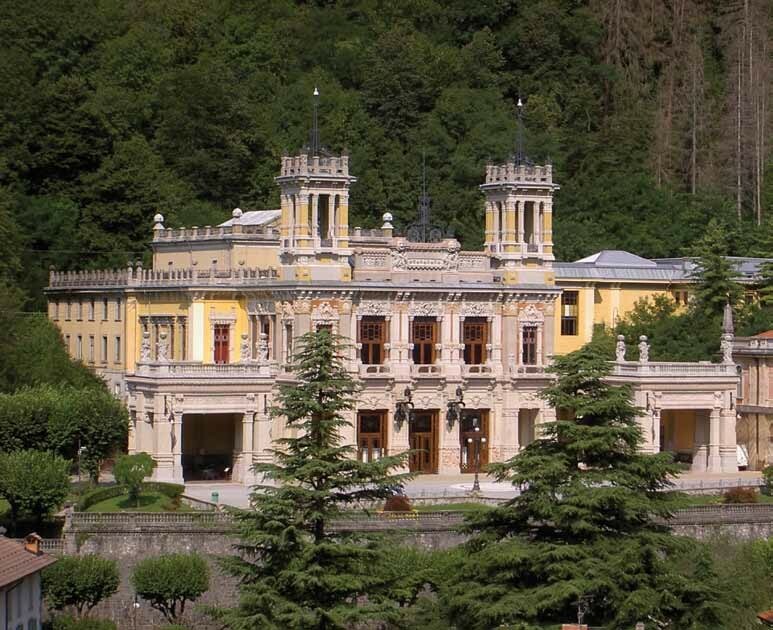 A visit to San Pellegrino Terme is a must in order to discover other magnificent samples of the Liberty Style.